On 1 December 2016 at the Trusteeship Council Chamber UNHQ, New York, I attended a briefing that was organized in collaboration with UNAIDS and the DPI NGO on the occassion of World AIDS Day. The speakers where : Simon Bland, Director, UNAIDS New York, Eric Sawyer, Founding Member of ACT UP and co-founder of Housing Works & Health GAP, Deborah Levine, Executive Director, Love Heals and Molly McHugh, Communications Director, GrassrootSoccer. A special performance of a song was done by Alex Ogbeh, an HIV and AIDS Activist and Mental Health Advocate with Housing Works. 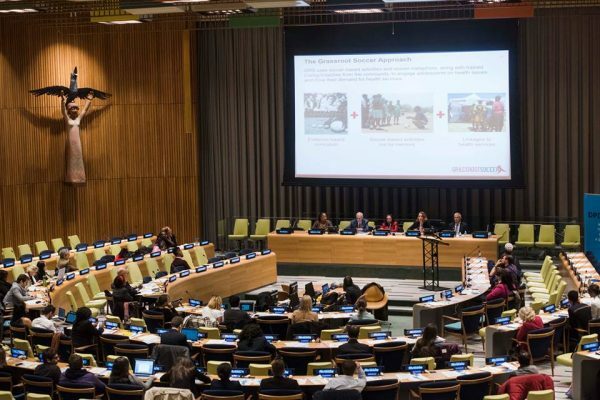 This important event was moderated by Padmini Murphy, the Global Health Director, New York and the Medical College and Medical Women’s International Association NGO Representative to the United Nations DPI. The cycle of HIV infection needs to be broken. According to Mr. Bland an effective reach of the 2030 SDG, can be attained by first attacking gaps in prevention while accelerating treatment. He said the fight in ending the further spread of HIV/AIDS depends heavily on the available financial resources , global solidarity, and shared responsibility for AIDS, in addition to local efforts with global outreach. The second speaker was Eric Sawyer. Mr. Sawyer gave a chilling historic account of the early days of the AIDS epidemic and how people with HIV/ AIDS were shunned and feared. He referred specifically to his personal experience with his then dying boyfriend who was refused treatment and admission in hospitals all around New York. He explained how he and others in his position were forced to form a protest group called ACT UP, which worked to bring attention the discrimination surrounding the epidemic and the need to get funding for housing, food, transportation, and service programs for people with AIDS. Mr Sawyer explained that ACT UP has since protested for government funding of drug research & development and for access to prevention and treatment in other parts of the world through global funding. He drew a vivid picture of the group walking in protest across the streets of New York in the 80s , carrying a coffin with no place to take it, to symbolize the inhuman manner in which people with HIV/AIDS where treated then. The next speaker was Deborah Levine. She spoke about Love Heals which gives sexual education to the youth and use the comprehensive youth-led local advocacy approach in teaching young people about the facts of the HIV/ AIDS epidemic. She explained that Love Heals works with young people in the tri state area and went on to inform the youth of the great strides the organization in collaboration with supporters and partners where able to rich in 2015. She reported that in that particular year no child was born HIV positive in the tri state. Last but not least Ms. Molly McHugh made a presentation that told of how adolescents are among the most affected by the AIDS epidemic. She appealed to these youths to turn this sad statistics around and actually be the force of change that would turn things around. She explained that her organization, GrassrootSoccer which uses soccer to educate, inspire, and mobilize youth in developing countries has achieved great strides in helping youths live healthier lives in these countries. The briefing was ended with a beautiful rendition of song by Alex Ogbeh, a gay man and activist from West Africa who told of how he came to the United States to seek asylum because his life was in danger in his country of origin, that currently still shuns gay people and especially those that have HIV/AIDS. The message that was clearly conveyed was that education, tolerance and prevention is the key that will eventually unlock the door to ending the AIDS edipemic by 2030. Hope! for a better and healthier future generation is no longer so farfetched.